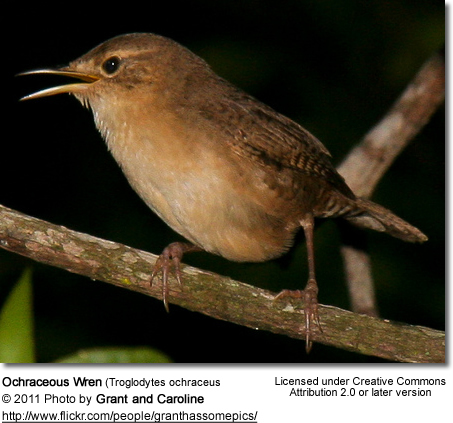 The Ochraceous Wren (Troglodytes ochraceus) is a small songbird of Wren family. It is an endemic resident breeding species in Costa Rica and eastern Panama. It is sometimes considered to be conspecific (of, or belonging to, the same species) with the Mountain Wren, Troglodytes solstitialis, of South America. It breeds in mountains at 900 m to 2500 m altitude (sometimes up to 3000 m) in wet epiphyte-laden forests, and semi-open areas such as woodland edges, tall second growth and pasture with trees. Its cup nest is constructed in a swinging mass of epiphytes hanging from a branch 5-15 m high in a tree. The eggs are incubated by the female alone for about two weeks to hatching, and the young fledge in about the same length of time again. The adult Ochraceous Wren is 9.5 cm long and weighs 9.5 g. it resembles the House Wren, but is brighter with broad yellow-buff supercilia. It has pale brown upperparts with buff underparts, becoming whitish on the belly. The sides of the head are a rich ochre colour. Young birds are similar but have paler supercilia and mottled underparts. The call of this species is a thin peeew, and the song is mixture of whistles and trills. These birds forage actively in vegetation in pairs, family groups, or as part of a mixed-species feeding flock. They eat mainly insects and spiders picked from branches, tree trunks or tangles of mosses, epiphytes and vines.